Retired after 40 years in management, Ken has been happily married for 43 years. He and his wife have 3 children and 2 grandchildren. Tis the season to not be thrifty, fa-la-la la-laaa-la-la-la-la. 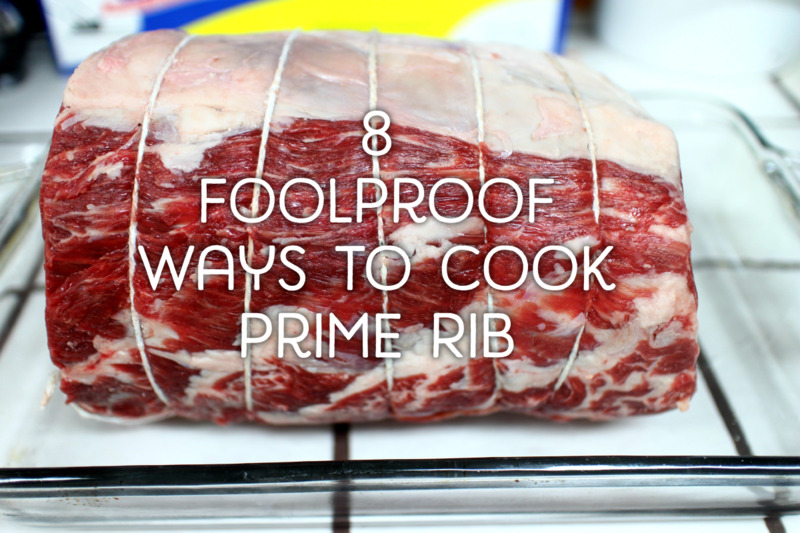 Here are my secrets to a great prime rib. 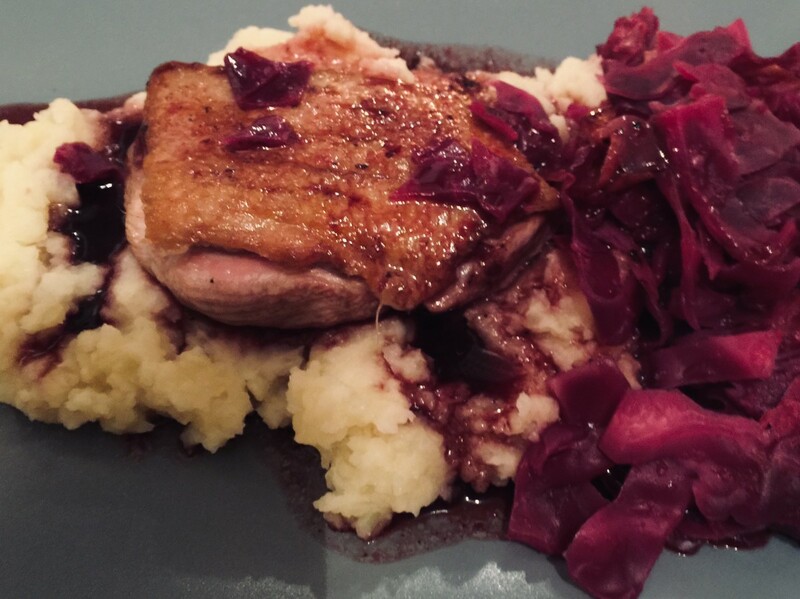 If you are so inclined to share my view of wanting a special Christmas dinner and this meat is within your holiday budget, you will absolutely love this meal. 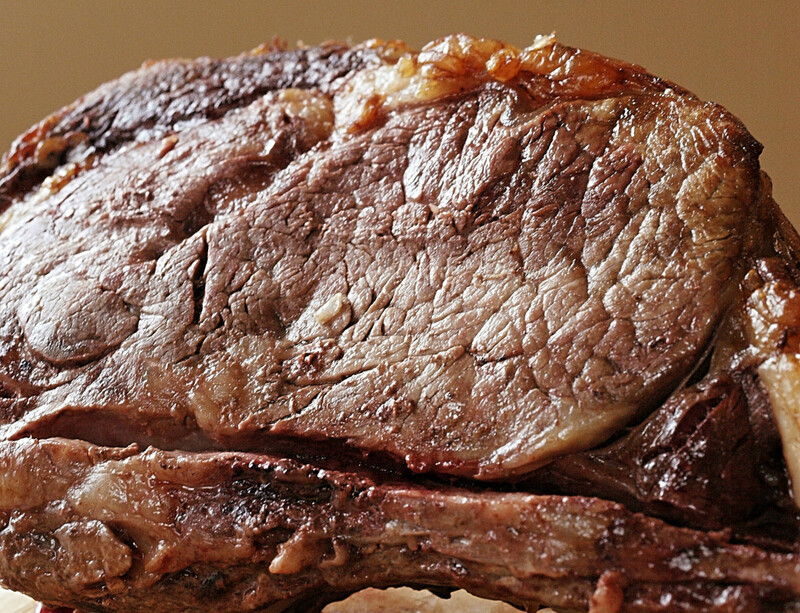 Look at the color of the prime rib; it should have a bright red color and no dry or brown edges. This is secret number one. Size: For a generous serving of roast, figure on two people per rib. (Adjust the size of the roast by how many people you want to serve. Just remember to figure two people per rib.) Also, it will cost more, but please buy a four rib "first cut" roast. It is a rib roast from the small end toward the back of the rib section, which is leaner and gives you more meat for your dollar. It is definitely less fatty. Now onto the prep and cooking. This is as easy as it gets! Take the roast out of your fridge at least one hour prior to cooking and let it come to room temperature. Pat the roast dry with paper towels. Preheat the oven to 450 degrees F. Smooth butter onto the top and both sides of the roast. Generously salt the top and sides of the roast with Kosher Salt or Sea Salt. Add some black pepper to taste and a small amount of garlic powder. Using a metal roasting pan (the inexpensive aluminum ones work fine), place the roast rib side down (fat side up) into the roasting pan. Salt generously on both sides of the roast. Sear the roast at 450 degrees for 15 minutes only. 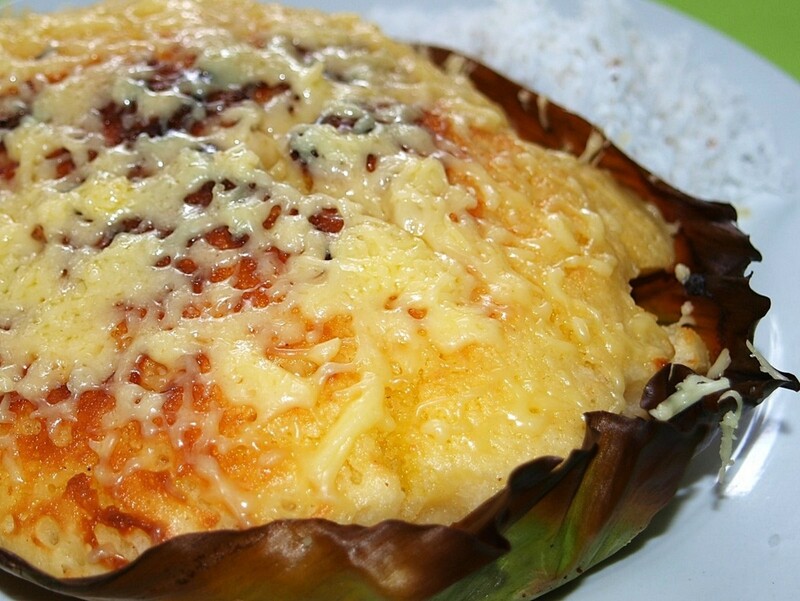 Then, turn the temperature down to 325 degrees and let it cook for approximately 1 ¾ to 2 hours. This will produce a medium rare roast. The target internal temperature is 125-130 degrees. Please ask Santa for a good meat thermometer. This is the only way that you will know when to stop the cooking process. About 1/2 hour before the estimated end of the roasting time, begin checking the internal temperature. 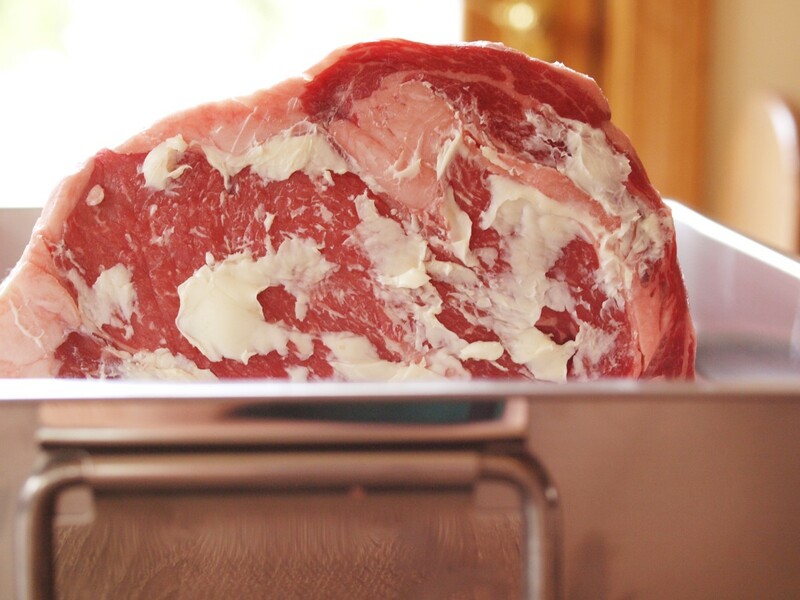 Cook until rib roast reaches an internal temperature of 120 degrees F.
Remove from oven, cover with aluminum foil, and let sit approximately 15 to 20 minutes. The resting time will raise the temperature to the desired 125-130 degrees. When you are ready to slice, carefully cut the roast away from the rack of bones. 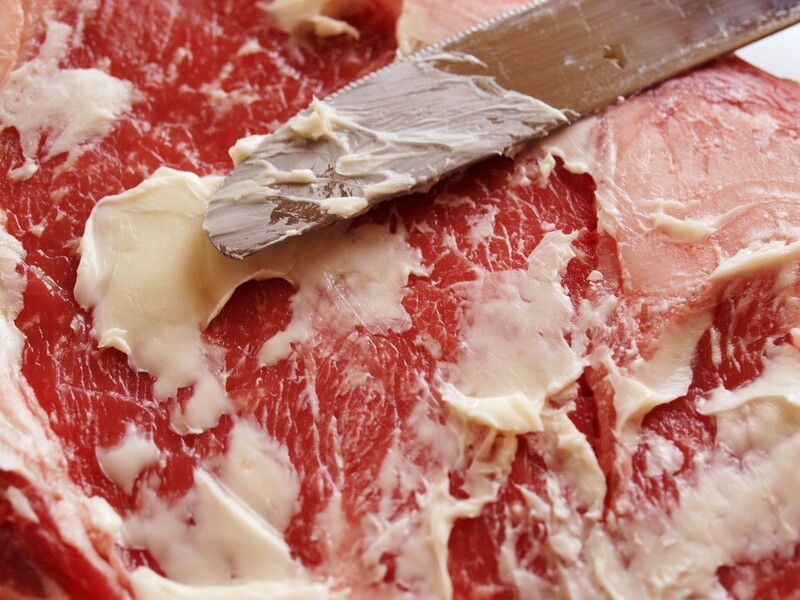 The butcher will have removed the chine bone already, so take your time and use a good sharp knife. Then I measure the length of the roast and divide those inches by the number of people eating (in our case eight) and then slice the roast into evenly thick slices. Make sure the roast is tied. Spread one tablespoon of softened butter on each cut side of the roast. Using a metal roasting pan (the inexpensive aluminum ones work fine), place the roast rib side down (fat side up) into the roasting pan. The finished roast! (after resting for 15-20 minutes under tented foil). When you are ready to slice, carefully cut the roast away from the rack of bones. Then, measure the length of the roast and divide those inches by the number of people eating and slice the roast into evenly thick slices. I have deliberately been very precise with these instructions, so it may seem like a difficult process. Uh-uh, nope! It’s actually easy and delicious. That is the perfect prime rib. Christmas only comes once a year and it is our day to enjoy our children and grandchildren. I want them to enjoy a meal that will help capture the spirit of the day. But, this one will cost a few bucks, so I found this method to really produce the best I have ever had. 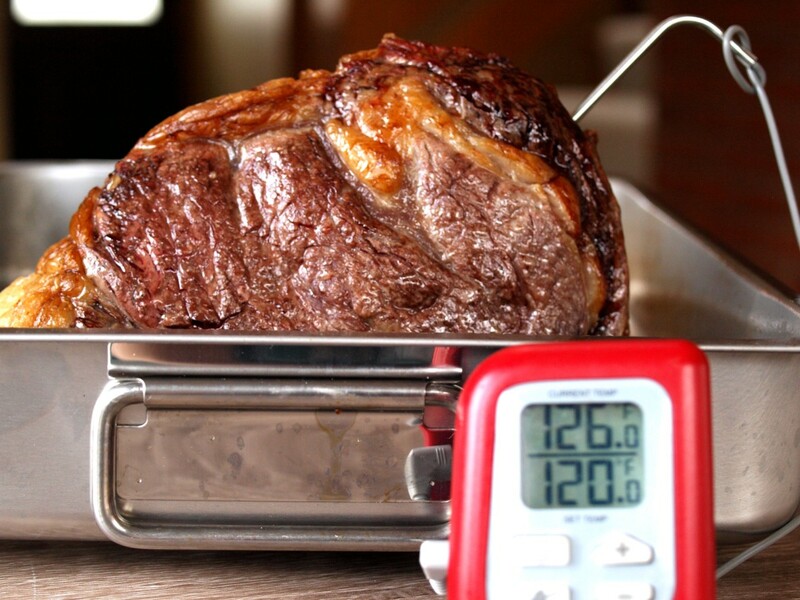 Use a meat thermometer to test the doneness and start at the 450 degrees cooking temperature for the first 15 minutes and then at 325 degrees for the remaining time. Before you know it, Christmas will be here. I like to use my prime rib recipe on Christmas day. 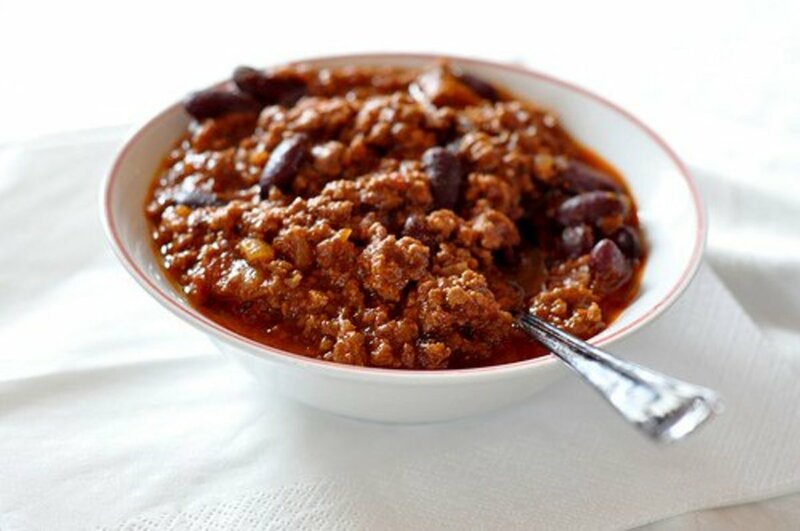 However you can eat this delicious dish any time of the year if you are still able, despite these hard economic times. I know that my household is on the downside of some economic strife, so our gift list is very limited. We still plan on preparing a special Christmas dinner using my recipe, though. It is a new tradition we started two years ago and one that we want to try to continue and consider it a gift to our family. 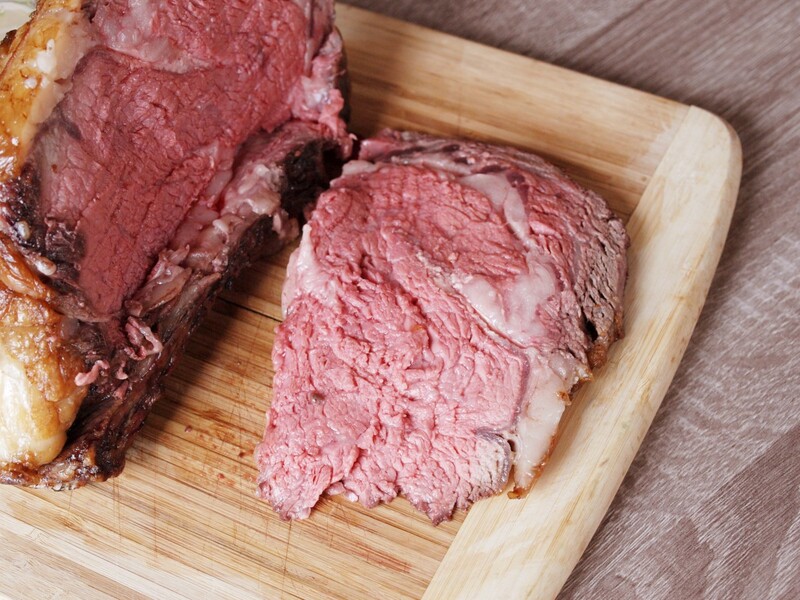 I enjoy preparing prime rib, and it keeps me out of the kitchen when our kids and grandkids come over. 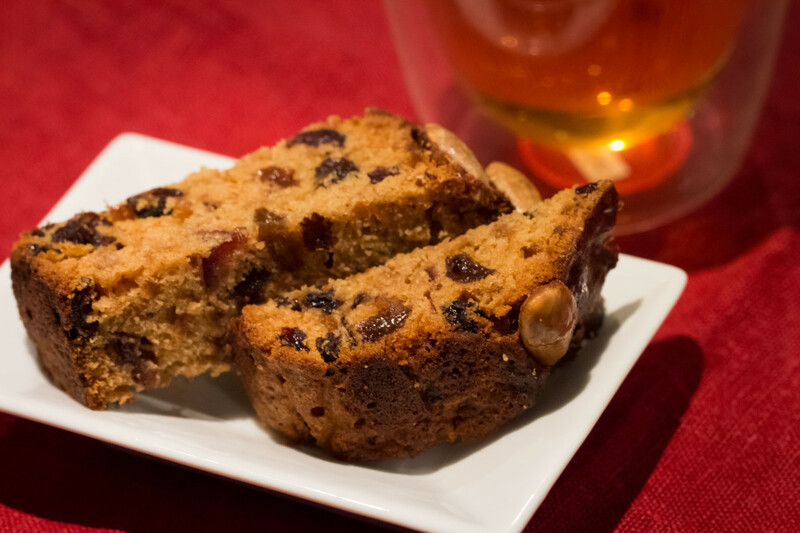 This recipe beats the time and fuss of the former traditional turkey and all the fixins’ that we used to do. This is the day my wife and I look forward to all year long. Our three adult children are over. My son-in-law and daughter-in-law have expanded our family unit. Our two grandchildren are there and we all just relax and enjoy the day. There are gifts under the tree, but we are very unstructured. Everyone comes when they can, but no early morning deadlines! With two little ones drooling over the gifts, my prime rib saves the day. It allows me the chance to prep and then let the oven do all the work, while I join my family on this special day. Do you not recommend spices be used on the top of your roast? If so, how much? Yes, there has been an about-face on the question of using salt and/or spices on your roast. So now, at least an hour before you will start cooking the roast, generously salt the top and sides of your roast with Kosher salt(I’ve also used sea salt), I sprinkle black pepper on top “to taste “ and a small amount of garlic powder. Let it sit uncovered for at least one hour at room temperature. 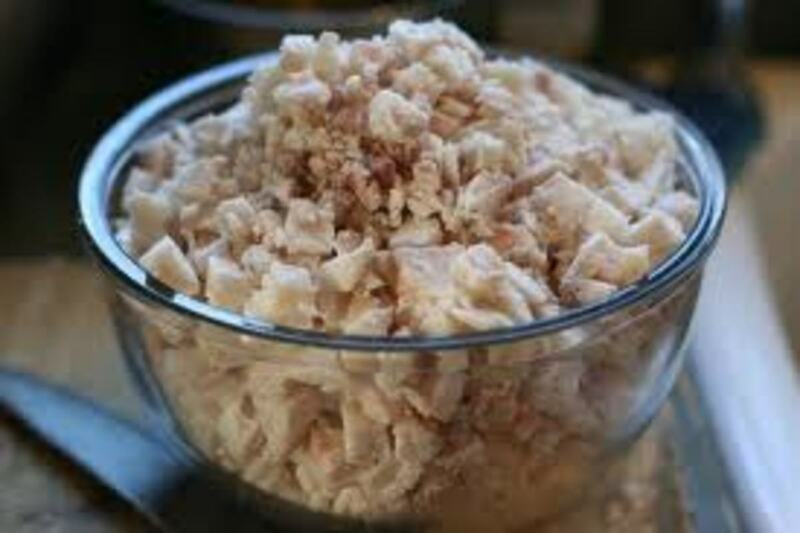 The salt will draw out some of the meat's juices which dissolve the salt. Essentially you now have a salty juice which cuts through some of the meat's proteins and re-absorbs into the inside of the roast. How many pounds was the prime rib? Even tho I was staying more to the standard of two people per bone to ensure proper serving portions, this prime rib roast was slightly over 9 pounds. Remember after cutting the roast away from the bones, you end up with perfect portion sizes when carving for eight in my case. The picture doesn’t show, do you use a rack in the roasting pan? No, I don’t. One of the beautiful things about a bone in roast is you put the prime rib in your pan with the fat cap side up. The bones of your roast serve as its own natural rack. 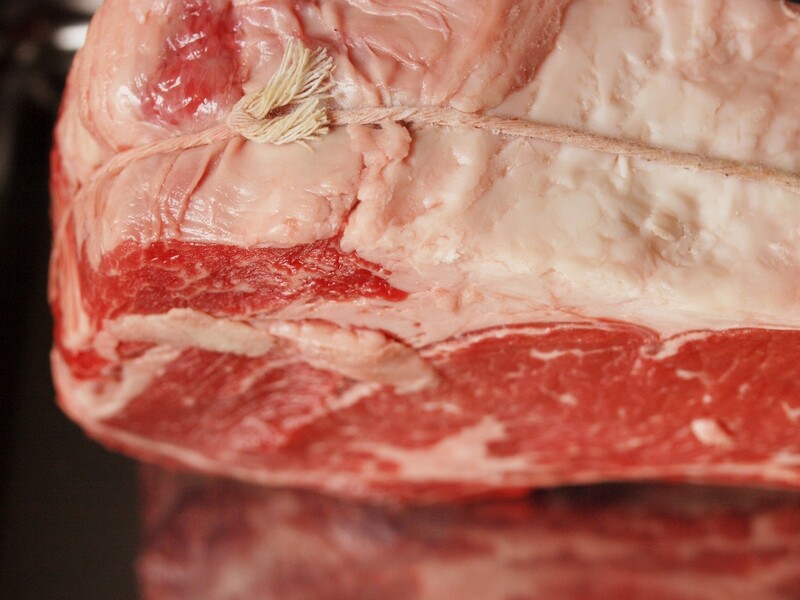 When do you remove the string when making a prime rib roast? 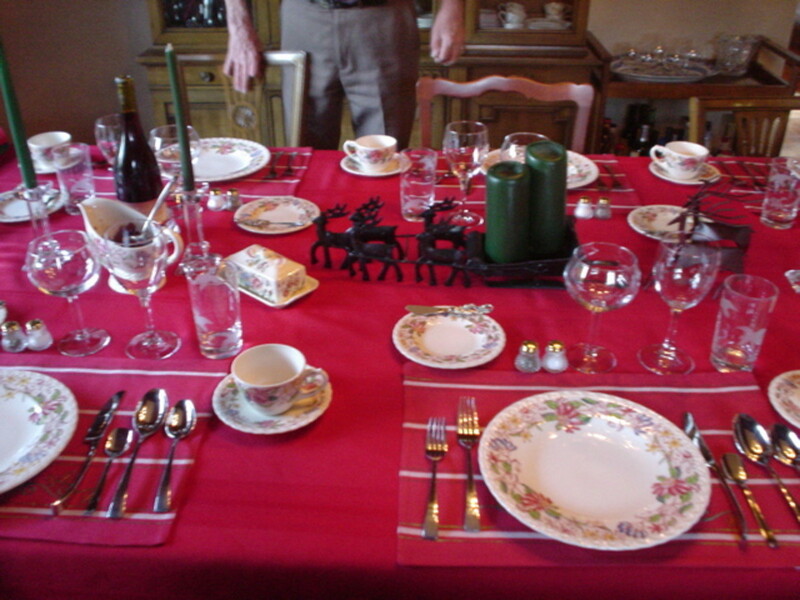 The string is removed after the roast is done cooking. Do I sear the prime rib on all sides or just the one side? I do both end cut sides when I sear. Who doesnt do leftover beef stroganoff? I am sorry sure there are alot of different variations personally Prime Rib to me is a very good tasting piece of meat just made one yesterday but I never add anything to it no salts, garlic anything and as someone else said I don't like my beef mooing back @ me again my preference but I always cook mine to 170 degrees and never not once was it dried out anywhere or tough & I do believe thats the part of the prime rib that gives it it's flavor & keeps it tender @ any doneness is the fat. I simply brought it to room temperature set oven @ 235 first for a couple of hours then down to 205, I put roast in a throw away pan rib side down covered with foil put a probe thermometer in roast set my temperature on thermometer to 170 about 5 1/2 hours later it reached temperature I turned oven off left it in the oven untouched for probably about 2 hours when I took it out the meat fell off bone completely on it's own when I picked it up and were big eaters I guess but I did 1 rib per person I had 5 ribs & 5 people worked out perfectly as some others we don't do left over rib roast. I cut off the last big chunk of fat left on top and gave some not all to my dogs I can do that with no garlic ( dogs can't have garlic, onion )or anything on my roast and that how simple I did it and it would cut like butter. I’m making a Ham also with the prime rib. My husband wanted to know if you can cook prime rib on the outside grill? If anyone has used the math method, I suggest it. My rib was perfect. Any questions hit me up for the calculation. Happy cooking. Take the weight of the roast and multiply by 5. So if a roast weighs 6.3 pounds then the cooking time will be 31 and 1/2 minutes. Preheat oven to 500. When ready, place roast in for the "exact" cooking time + 1 minute for temp. lost when opening and closing door. When time is up, turn oven off, walk away and NEVER open door until 2 hrs. have gone by. Pull out roast and since it has already "rested" while in the oven, Slice and serve. DELICIOUS. Yes a good coating of sea or coarse salt and pepper will make it cook up even better. It will stay very moist. If you want it med to well done, I would think you'd add another 10-15 min. at above temp. to get it that way. I like my meat medium to well done. How long should I cook the meat and will it be dry. First time making Prime Rib. Any suggestions greatly appreciated. Hi, I thought a whole rib roast was only 7 ribs,but you suggest 9-12? In your prep section you mention not to add salt oterwise it'll dry out the roast. And it sounds very good im getting hungry just reading about it. Ken, have you ever tried it in salt before? Let me tell you something "It's just fabulous" here's my secret. I usually cook an entire rack. Since we are big family. In a large deep rectangular pan i cover the entire base of the pan with rock salt. I then sit the rack (bones down) in the pan. Then cover the rest with of the roast again with rock salt. But before you cover the roast copletly all the way around with at least 3/4 of an inch all around you must rinse off the salt in a coleander or a china cap strainer and add moist after all excess water has drained away. "House of prime rib" also cooked in the same manner lawry's of Las Angeles. OMG...just give me a knife, fork a BIG cloth napkin and a basket of fresh from the oven buttered bread!! Another good piece of cow is a flank steak, it's thin and should be warmed not cooked and is pure meat. Great for sandwiches with horseradish cream if there are leftovers. Excellent....watch the thermometer!! Does not take much to overcook....took ours out at 125 and quickly up to 130-135..and a smidge overcooked !! Sorry it took so long for me to reply to you. I finally sent an answer today, I've been gone for a while . Truthfully, since the original article, the norm has switched to season before cooking. I do use a decent amount of sea salt and some black pepper. Current thought is the salt will permeate the meat and instead of drying the roast, the result is the juices will actually change the roast through osmosis and react with the fat cap to form a nice crispy crust to the roast . Thanks for reminding me to update. Absolutely you can buy a smaller roast. The rule of thumb is one rib for two people. If it's hard to find a small one rib roast, you can buy a relevant size roast and freeze the portion you don't want to work. A well sealed roast should last about 3 months in the freezer. Just make sure you defrost the roast thorough and dry it off plus bring to room temperature before cooking. 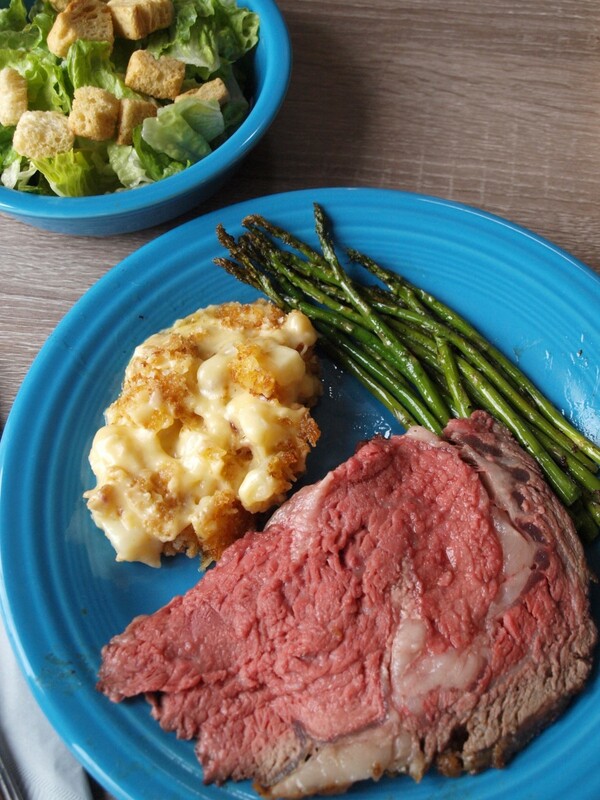 The prime rib in this picture is perfect! I have found this method to produce a great end result as well! To wpcooper: I often make this for just myself amd my husband. You can do a 2 pound roast, adjust cooking time, and it will turn out just as good. I do agree that i dont like it reheated, so any leftovers we eat the next day with horseradish cream sauce. We remove it from the fridge and let it come to room temp before eating, and then we practically fight over it! Its the only meat that gets us feeling stingy! Are there no seasonings at all? Just curious...what would you recommend for a single or two eaters? Can you do a smaller prime rib? I don't like to heat up old prime rib after I've cooked it. It usually isn't as good. Boneless rib roasts are fine in place of the bone-in roast, especially if you don't like gnawing on the bone like I do or want to give your pooch the bones. The answer may surprise you, but the boneless roast needs appx. 20-30 minutes longer in the oven because the roast weight is all meat. Just make sure that the roast is still fat side up and put it on some type rack, even if just a cake rack. Thanks for reading ! Prime Rib sound good to me.